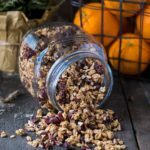 This simple maple cardamom granola made with cranberries, pecans, oats and a hint of orange is great for breakfast, snacking and makes a great holiday gift. In a bowl, blend cashew butter and maple syrup until smooth. Add oats and slowly incorporate into mixture. Smooth onto greased baking sheet sprayed with coconut oil. Bake at 325 degrees for 8 minutes then remove & break up big pieces and stir around and bake again for an additional 8 minutes. Cool completely (will become more crunchy as it cools). Toss with pecans and cranberries. Add orange zest and toss until well combined. This makes a great gift, especially for the holidays. Place in a jar with a decorative label and enjoy giving a gift from the heart.